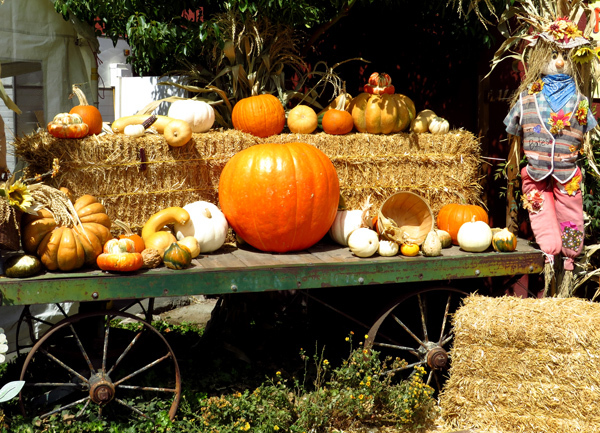 Fall in San Diego: mountains, apple picking and pumpkin patch, here we come! I know I’m going to jinx it by saying this but I think fall has finally arrived in San Diego. We got our first rain storm of the season last week, when we usually don’t see a drop of rain until some time in November. Now that’s something to celebrate! The mornings are crisp, the afternoons are warm, fall is in the air! These past couple of weekends, we’ve done a few things to say goodbye to summer and welcome fall. First we took a daytrip to the mountains and visited the small town of Idyllwild, where we vacationed this past June. I was wondering what it would look like after the two large wildfires they suffered during the summer but the town was untouched and most of the wooded areas around were left intact. And what a beautiful day we picked to go there! Take a look at the view as we were making our way up the mountains. 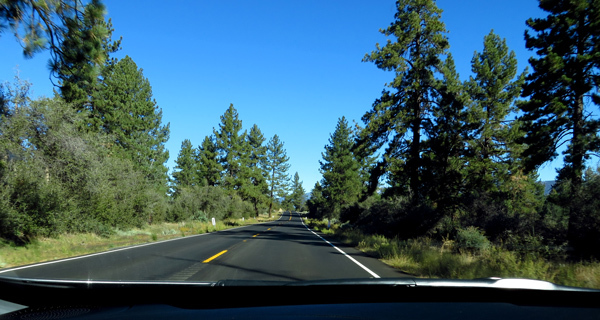 Not a single car on the road in front or behind us, beautiful pine trees bordering the road, and a great blue sky. We had breakfast in town, then went hiking, enjoyed a picnic in the woods, and hiked some more. While hiking in Idyllwild Park, we volunteered to fill a paper bag with acorns. The oak trees produced a lot of them this year and if too many new oak trees start growing, they will take away precious water from the older trees, which may dry up and become a fire danger. As we were picking acorns off the forest grounds, my 7-year old compared the activity to an Easter egg hunt, but with acorns. Very observant boy! 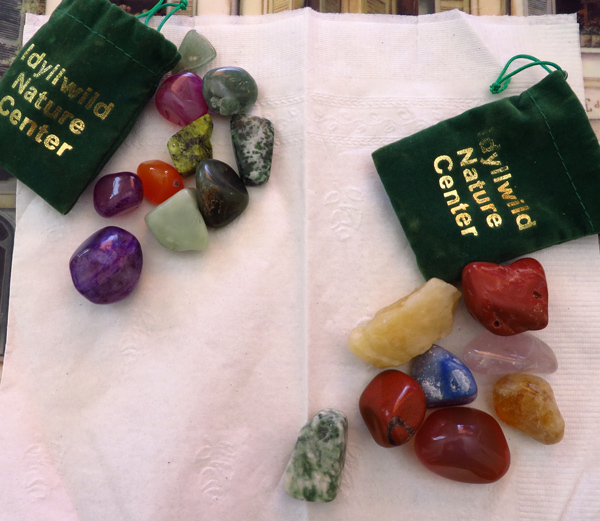 In exchange for our hard work, we were offered to fill two small bags with polished rocks. BEST reward ever for “helping to save the forest”, as my oldest said. Here’s our stash. Hey, there are even a few pink and purple rocks for me! We continued our taste of fall last weekend by visiting the town of Julian, California, about an hour east of San Diego. The very hot, very strong Santa Ana winds were in full force that day, blowing dust all over the place. The boys got to experience their very first windstorm but we had to find places that were immune to the wind drafts in the morning. One of them was Mom’s Pie Restaurant, where we bought a boysenberry pie. 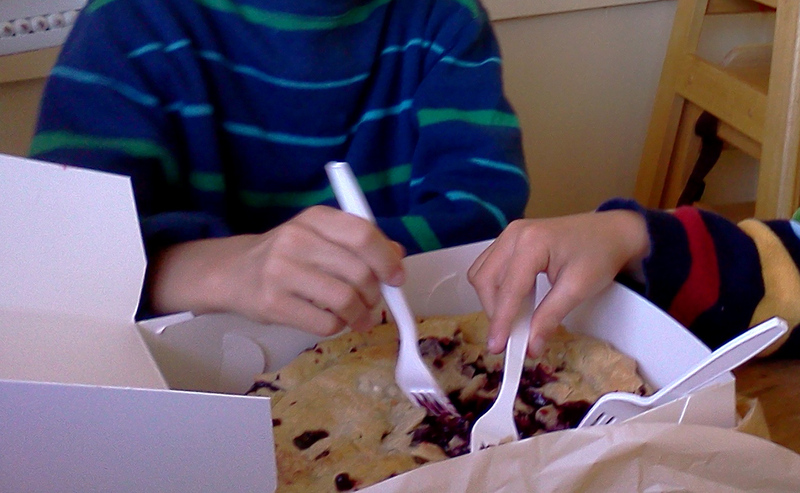 It was still warm out of the oven and so the three of us got forks and started digging into the pie for a midmorning snack. Best pie ever! The winds died down in the afternoon so we took this opportunity to go apple picking, and get fresh fruit off the tree. When I got home, I baked apple pie and made applesauce with the leftover apples. 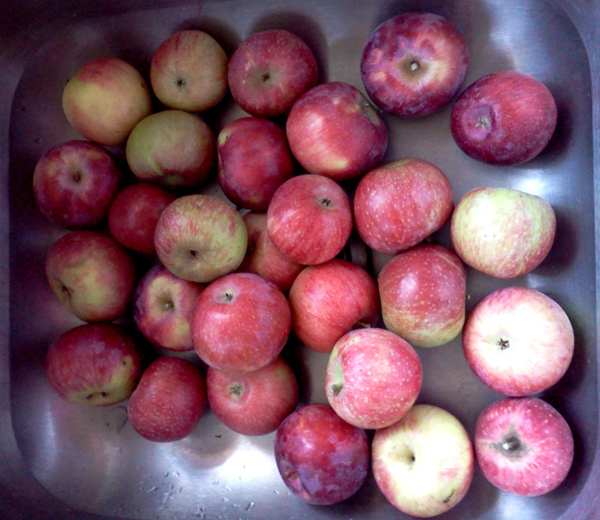 As you can see, I had my work cut out when it came to peeling these delicious apples! The day after was a no-school day so we went on another fall adventure, this time to visit Bates Nut Farm, a very popular pumpkin patch in San Diego. It was deserted on a Monday morning and the perfect time to go! 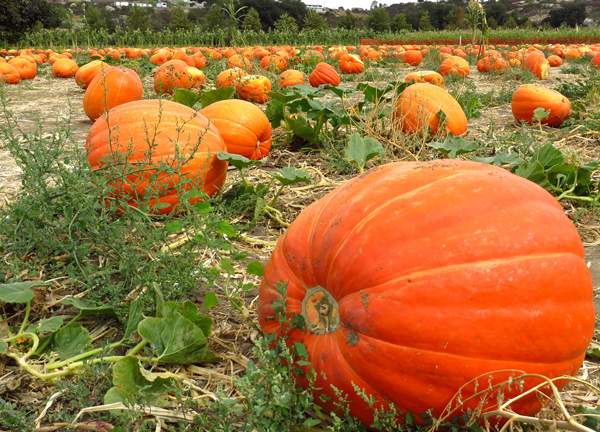 Of course, you can’t go to a pumpkin patch without visiting the pumpkin fields. That’s a lot of giant pumpkins! And that was only one field out of two. 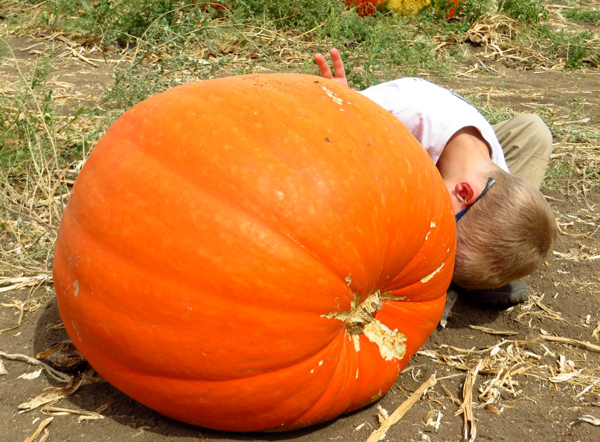 Do you know how much fun it is to play with the pumpkins? Oh, look, this pumpkin has bunny ears! I know this is just the beginning of fall in San Diego, as Halloween and Thanksgiving are just around the corner. But guess what my favorite sight at the pumpkin patch was? 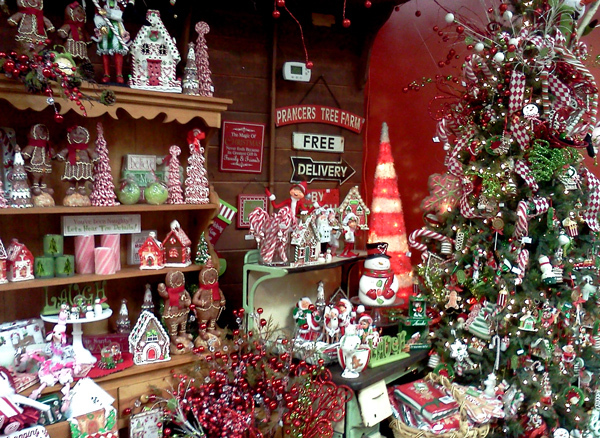 The Christmas decorations inside the store! It’s the most wonderful time of the year and it’s only 71 days away! When I discovered this week’s WordPress photo challenge theme was “foreign”, I had a lot of thoughts going through my mind at first. Eventually I decided to have a little fun with the theme and I hope you’ll enjoy it too. 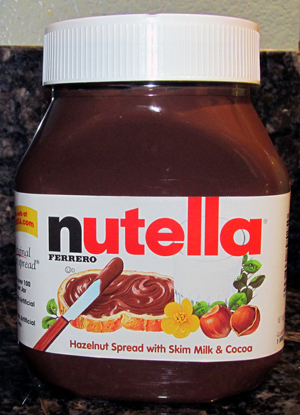 Foreign: Nutella – the best food to come out of Italy. After pizza of course. And pasta. This is one of my very favorite stories, one about an aviator – a foreigner to most of you unless you’re French – and a little prince in a foreign country. Creative, poetic and simply beautiful. Etranger has two translations in English, depending on its meaning: stranger or foreigner. Camus used this title especially because of its double meaning. His character lives in a foreign country and he also doesn’t fit in a normal society. This made it difficult for English translators to pick the right title originallyand the book was published as both The Stranger and The Foreigner for a number of years. Today publishing companies have agreed The Stranger is the better fitted title. Of course, I saved you the best for last. Now that’s a lot of pandas, huh? 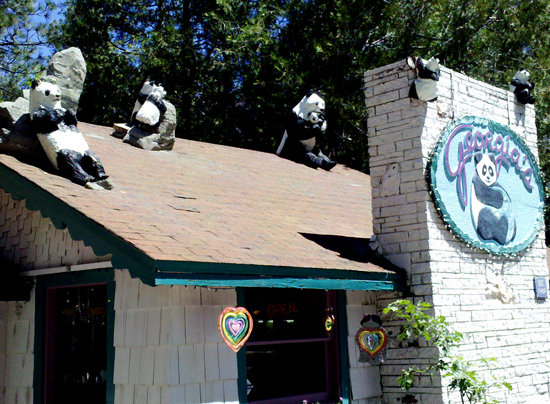 These pandas are sure to make you look twice as you walk by this shop in the small town of Idyllwild, California. They’re completely out of place and quite a foreign sight, but I think they’re brilliant in attracting potential customers. Taking pictures of something close with an interesting (but not distracting) background is often a challenge. 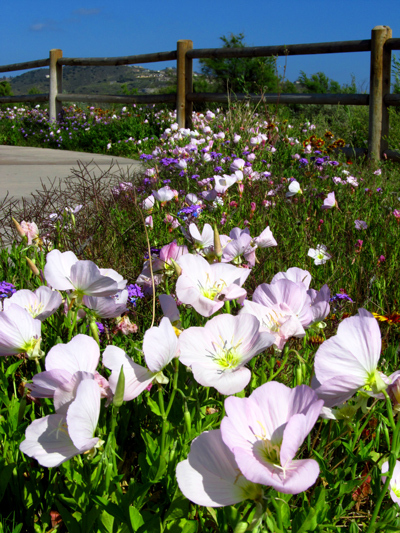 A few months ago, when wildflowers were blooming all around town, I spent some time at a local park to take pictures of them and the scenery, trying to show perspective. I’m not sure I managed to do it, so I’ll let you judge. You can see more of my photos on my photography website. 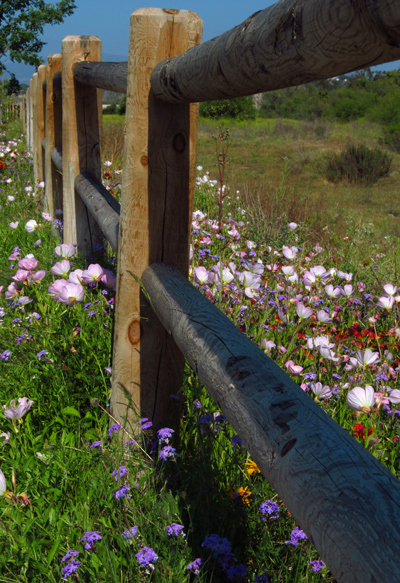 Here’s a nice patch of colorful wildflowers, with a typical San Diego hill in the background. I liked the fence so I tried to play around with it to show how far it went. 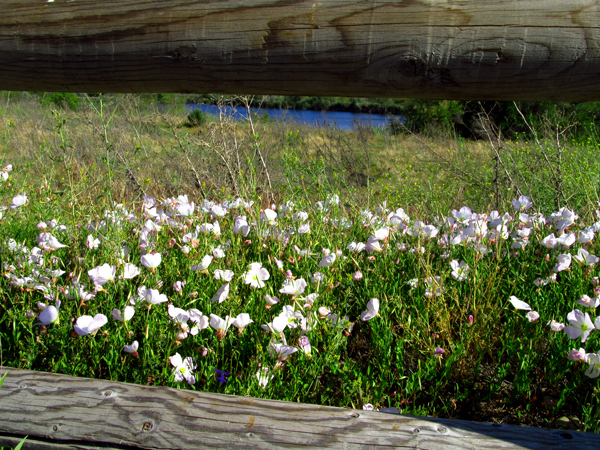 The next photo shows a glimpse of the San Diego River in the background. I took the last picture during our recent vacation to Idyllwild, California. 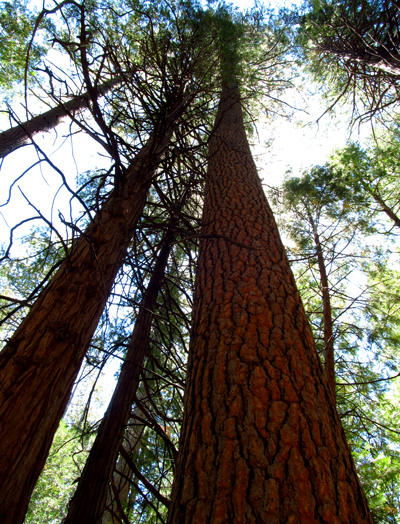 I love the large pine trees you can find everywhere in the forest and how small you feel when standing at the bottom. The lightning is all wrong for this picture – there’s nothing worse than trying to take photos towards the sky in the middle of the day, but it gives you an idea of how far up these trees can reach. Nature never stops amazing me. I spent the last few days of June and the first few days of July on vacation with my boys in the beautiful mountains of Idyllwild, California, a couple of hours northeast of San Diego. We used to have beautiful wooded mountains only 30 minutes away from our house, but they all burned down in the San Diego wildfires of 2003, and again in the wildfires of 2008. Don’t let people fool you when you hear nature grows back from fires. It does, but it takes a ridiculously long time. It takes about five years for bushes to grow back, such as the California Sage Brush, and 20 to 30 years for most trees to recover. I can be the patient kind but 20 years to see some real trees is way too long for me. To be honest, the lack of abundant green is what I miss the most by living in San Diego. The closest large wooded area full of fragrant pines is around the small town of Idyllwild. There is a lot of nature to enjoy and some cute small shops to browse. I’m working on sorting through the hundreds of photos I took there and I’ll highlight our vacation in an upcoming post. In the meantime, I wanted to use one of the photos I took there for this week’s wordpress photo challenge about movement. Movement is actually something I dislike when taking pictures. I try to take pictures of creatures that move (e.g. wild animals, my kids) but their constant, abrupt movements make taking photographs quite challenging, and usually blurry or out of focus. 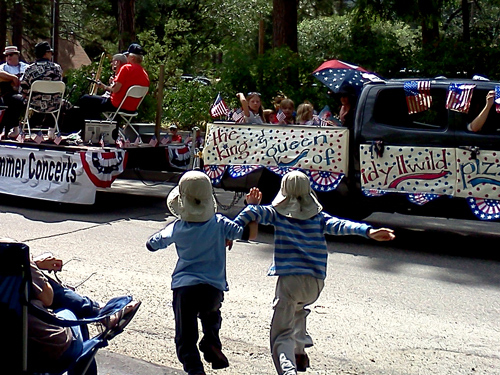 I took the picture below on the morning of the Fourth of July with my cell phone camera and it somehow turned out OK. Idyllwild organizes a parade to celebrate the holiday, something my kids have never attended before. The parade happened to take place on the street right in front of our cottage, so we had a great view. The boys were a little uneasy about watching the parade (they thought it’d be boring) until they realized people were throwing candy! After that, I couldn’t get them off the street and they had a great time. Here they are, arm locking each other while running, to see who will reach the candy first. Safety note: although it looks like they were running right into the street, they didn’t get in the parade’s path. That would have ruined the candy fun.